In Inka and Markus Brand’s board game Village, you place family members in various buildings to improve your reputation score. However, the people age and die throughout the game. Success is a matter of adapting to the tempo of the generations so that you get the most benefit out of each family member’s life. This theme of death sounds morbid, but the game treats it abstractly and arguably as part of the natural cycle of things. 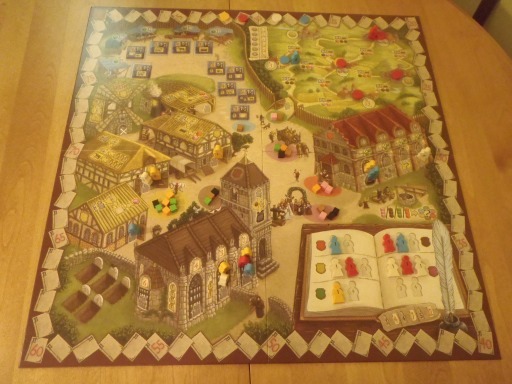 Let’s get this out of the way to begin with: Village is not a worker placement game. Everyone thinks it is (even the BGG page lists that as its sole mechanic), but “worker placement” has always been about more than literally placing workers. The term really refers to selecting actions and blocking them from the other players. Here, though the workers gain abilities (“professions”), they don’t return to your supply to eventually free up the space, but they also don’t block other meeples from joining them. Calling this a worker placement game does nothing to actually describe what it’s like. Strangely, though, there is action drafting similar to what the term “worker placement” entails. It’s just separate from the worker figures: At the start of each round, colored cubes are spread around the available action spaces, and on your turn you choose your action by taking an available cube. The cubes are required to pay for certain actions, so you will sometimes pick an action for the cube you need instead of the action itself. Personal board, with the time tracker, resources, and family members working the “farm”. Some cubes are black instead, which bring a “plague” advancing a time marker. Powerful actions also take time. All the meeples have numbered “generations”, and every time a player’s time tracker completes a circle, one of their lowest-generation meeples must be removed. You’ll need the powerful actions to win, but not so many that all your people die. These family members do various things, either producing goods or providing points by increasing the family’s reputation. Keep in mind that when you train someone to produce a certain good, they won’t be around to do it forever. Also, some of the point-scoring areas are only counted at the end of the game, so there’s no reason to fight for them in the first generation. On the other hand, the “village chronicle” tracks the founders who passed on, which basically brings a benefit for early deaths. The various things to do aren’t that interesting: Pay time and cubes to generate goods, possibly also training a family member in that skill for a future discount. Sell goods in a market, the place that seems disproportionately responsible for most of the points. Travel through distant lands, which is expensive but pays off well if you can visit all of them by the end of the game. Advance through the ranks of the town hall, gaining abilities that could give you goods, points, or the starting position every round. (Note for action-drafting purists: This game has a simple turn order, so if someone pays to go first, the person to their left gets the benefit of going second without paying anything.) And so on. Thematically, there is a lot of variety, with different levels of competition at different areas. Practically, though, I never felt very driven. You can make a plan (get certain colored cubes or goods for a specific action), but it’s never a long-term plan, and there’s rarely much tension in whether you’ll complete it. After I played this game a couple times, I figured that I would rate it a B-. It’s got some clever ideas, but with nothing especially interesting about the implementation. It’s worth checking out, but there’s not much reason to stick with it once you’ve played a couple times and gotten used to it. But I’m starting to realize that we’ve recently seen a major increase in the quality of new games. My Origins report had more high ratings than I’ve ever given, and I’m excited about many of the games that I’m currently playing and haven’t reviewed yet. I don’t feel like there’s still much reason to recommend a game just because it adds a few twists to existing ones. Village came out in 2011 or 2012 (depending on your country), and I understand the design philosophy that led to it. But this is 2013, an exciting year flooded with excellent games that provide a more complete experience. It’s time to raise my standards. You won’t regret trying Village, but you certainly won’t miss it if you don’t.